When working on a photo album or a scrapbook, you often need to do some photo editing: crop a photo, add brightness and contrast, fix colors etc. 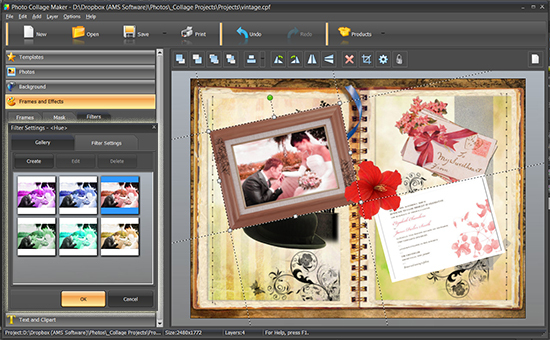 Photo Collage Maker lets you do that right on the canvas, while the original photo will be safe and untouched on your computer. Some of the editing tools are located right above the working area - these are the Crop, Flip, Rotate, Align, and Layer tools. 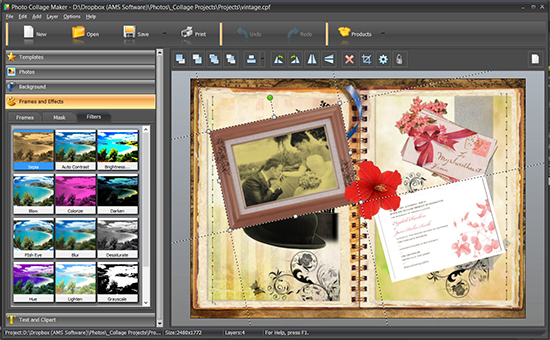 It's worth mentioning that arranging the collage layers is as simple and intuitive as it would be on paper! If you need to fix brightness, contrast, saturation, colors, or apply some fancy effect, open the Filters collection in Frames and Effects section. Here you can enhance your photo with one mouse click and play with artistic effects: sepia ("old film" effect), colorization, inversion, "pencil drawing", fun geometric effects such as "fish eye", blow, and twist. 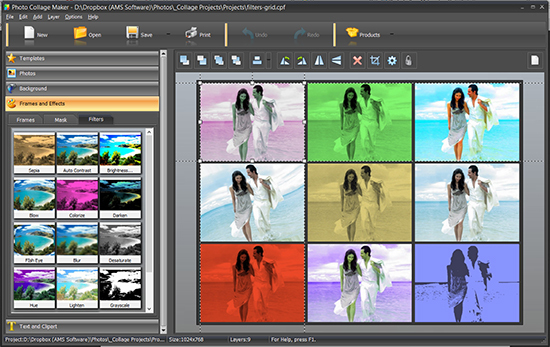 Every filter is applied with a mouse click, but you can open the advanced settings and fine-tune the details. Image filters help you enhance your photos, create a harmonious color scheme, and realize all sorts of creative ideas - for example, give a vintage look to a modern photo or make a grid collage in Pop Art style and share it on the Web!